CRAZY COOL GROOVY!!! 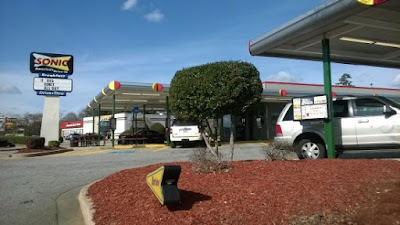 : I LOVE 2 EAT #209: SONIC DRIVE-IN!!! About five or six weeks ago, Yours Truly CCG was experiencing both automotive and desktop/internet complications!!! Fortunately; both issues are now resolved, but; the vehicular situation called for a trip to PEP BOYS on Jonesboro Road in Union City, GA. This was actually the second SONIC DRIVE-IN experience for CCG. The first time was during a road trip home to New Orleans five or six years ago. Don't really remember much about the visit. Arriving just after 11:00 AM, the parking docks were at about 50% total capacity. 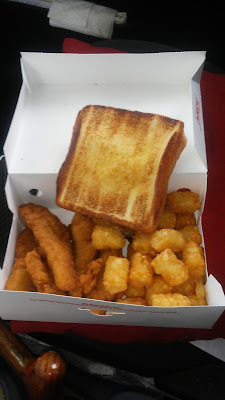 Taking a few minutes to peruse the menu, finally decided upon the 5-Piece FRIED CHICKEN TENDERS DINNER (photo below), which consists of 5 Fried Chicken Tenders, Tater Tots, 1 Onion Ring, and 1 slice of Texas Toast. Decided to wash it all down with a STRAWBERRY SLUSH. In fact, Yours Truly decided to bring home the very same dinner for both Sis and Niecy, but; with FROZEN LEMONADES for both of them.